Our local coffee shop staff have recently been calling us ‘the coolest people they know’, which is a great ego boost, but usually comes in the same sentence as a guess at our respective ages that are usually about ten years out. They’re a good bunch at our local Harris and Hoole, and are all very friendly. As they are nearly always up for a good chat while serving up, it’s become clear that many of our recent escapades seem to have become something like the stuff of legend. To be fair, the last few weeks have seen us doing a variety of slightly more weird and wonderful things with all the cosplay preparations for Fright Night, MCM London and this Halloween weekend, but talking with Lady M, neither of us feel particularly special or amazing. Far from it – we both work hard and plan our leisure time escapades carefully to get the most from them where possible – but I guess to hear the stories all in close order one after the other it could sound like we live some epic life of geekery that bears very little resemblance to normal life. 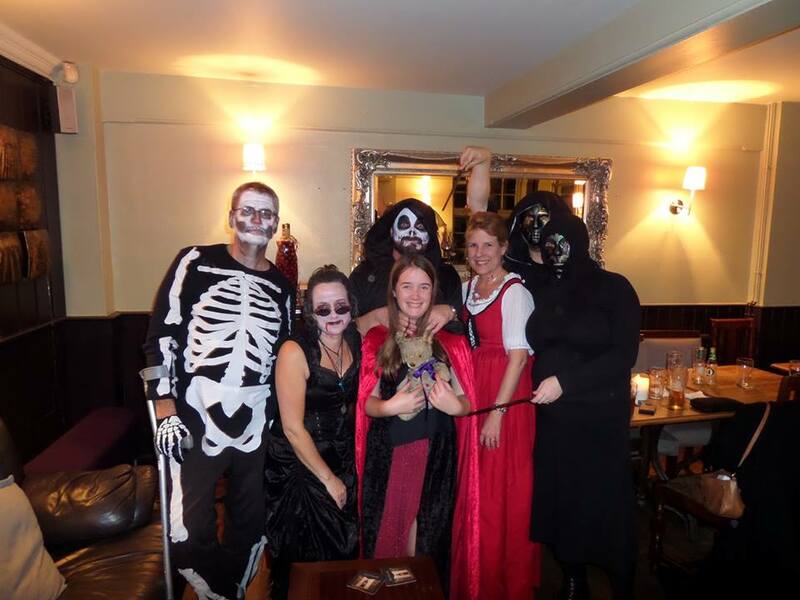 So this weekend saw one more outing for the death eater costumes – and this time it was to head down to the pub to meet C and her mother and assorted people for a few drinks after work on Friday. By far the highlight was watching a number of unsuspecting people leap in the air as we walked down the road once we’d parked the car by the green. As I was both driving and working in the morning I couldn’t really drink, so it was a good excuse to talk and catch up people I’ve not seen for a few months. It is also, surprisingly, the first time I’ve ever actually gone to a Halloween costume night at a pub. This entry was posted in celebrations, events, family, Geekery, hobbies and tagged cosplay, costumes, geekery, halloween, household, weekend. Bookmark the permalink. There are so many comments I could make here – it’s so good to see old and new friends (you and Lady M, respectively), to see two parents share geekery and the company of their daughter in spite of (or maybe because of) past trials, to feel in the company of friends. It’s all important. Thank you.